Thankfully, today I hit on an idea for an easy and fun edible Halloween craft...PIZZA! I found five different Halloween pizzas (owl, vampire, spider, pumpkin, and cat) in Phyllis Hoffman's "Celebrate~Halloween﻿" magazine~October 2010. Love her publications! My husband actually said that this (pesto pizza) was the BEST homemade (more like semi-homemade) pizza that I've ever made, and we've been married for a looong time(we are grandparents, after all), so that's saying a lot! I must agree with him; The pesto/alfredo sauce blend turned out to be delicious! As an added bonus, both of these pizzas were super simple to make! Preheat oven to 375 degrees. Spread pizza sauce over naan, leaving a 1/2-inch border. 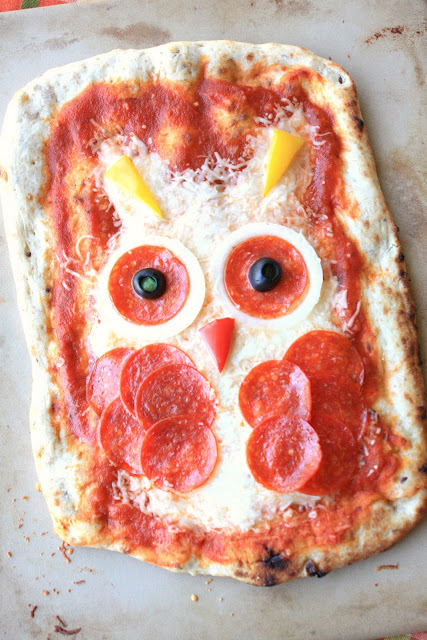 Sprinkle with cheese in the shape of an owl. Use 5 slices of pepperoni per wing, placing pepperoni on each side of body, slightly overlapping slices. For the eyes, place onion ring slices on face. Place a pepperoni slice on the center of each onion slice. Top each with half (open end) an olive, placing a small piece of green bell pepper in the center of each olive. Cut 1 triangle from the red bell pepper for the beak, and 2 triangles from the yellow bell pepper for the "ears". Bake at 375 degrees for 8-10 minutes (on pizza stone or baking sheet), or until heated and cheese melts. For a crisper pizza, bake 12-15 minutes. Preheat oven to 375 degrees. Mix pesto and alfredo sauce togeteher and spread over naan, leaving a border of at least 1/2-inch. Sprinkle cheese over the sauce. Cut a triangle out of each pepperoni slice and place across the top of head for the hair. Use leftover pieces of pepperoni (or extra pepperoni slices) to form the mouth. Cut ears (the bell pepper is naturally "ear" shaped, when sliced) from the green bell pepper, and cut two small pices for the bolts, at each bottom corner. Cut a piece of the red bell pepper in the shape of a nose and place in the center of the face. Slice two olives in half. Place one piece in each eye, and one piece at the end of each bolt. Slice a couple of olives into slivers and place them to look like scars. Bake at 375 degrees for 8-10 minutes (on stoneware* or baking sheet), or until heated and cheese melts. For a crisper pizza, bake 12-15 minutes. I know my munchkins will love these pizzas, and I think yours will too! *FYI:: My stoneware is not dirty, just "seasoned". It is virtually non-porous, is non-stick and washes off with water. I also bake all of my cookies on stoneware and I think it's impossible for them to burn. No parchment or greasing is needed either:) Love all of my stoneawre! Amazing ideas Sue! 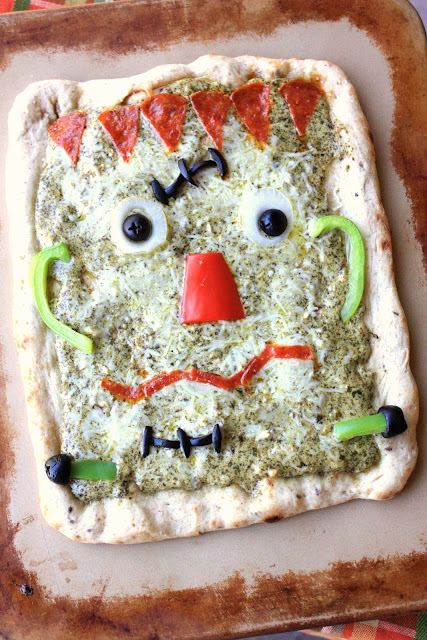 How fun to use pizzas as a Halloween treat! You have transformed 2 ordinary pizza to something AMAZING! Always a big fan of your creativity! Oh wow - these are super cute!! I love my stoneware. I sell Pampered Chef just so I can give stone ware as gifts. They have a fun new pizza pan with built in handles. So much easier to maneuver. It comes in round and rectangle sizes. I do love my stoneware! This is awesome!!! As I said before you are the best grandmother ever! You sure are going to be super popular with all the little munchkins that will soon learn your name and I can't wait to see all the news ideas you'll be making for all the new additions to the family. cute & clever idea! love it. That's so cool!!! Love it! How fun is that? I wish you lived in Utah, so I caould talk you into coming to teach a cooking class at South Fork! Love your ideas for feeding "munchkins" ! Oh my gosh, these are just amazing! So cute and creative. I think I'm going to have to try both of them. Love it! I am going to scream now! Aaahhhhh! These are awesome. I have pinned them both! I am going to have to make them! These are so cute. So festive! :) My little boy somehow doesn't like pizza. But I guess he'll love this. Oh I love them, just wish I lived with my nephews and nieces to make them. Wow! These look amazing. I would love for you to link up to my Wickedly Creative Halloween Ideas Party. Frankenstein is fabulous! We are going to have to fire up the pizza oven and then I am going to have to surprise everyone with your creations! I can't find my Halloween magazines from last year and this years have been soooo uninspiring. You will have to check out my witch cookies. I kept thinking of you as you do the most fabulous cookies! Oh my goodness! Whoever is hosting a Halloween party has to make these, what a great idea. In fact, you don't even to to be having a party, these would be just so much fun to make. So cute! My kids would love this, especially the owl! Thanks for sharing! OH MY GOODNESS!!!! This is BRILLIANT, BRILLIANT, BRILLIANT!!!! I can't wait to make this our new Halloween tradition!! I LOVE IT!!! Seriously, I'm obsessed with this idea, I may not sleep at all tonight. Thank you so much for sharing it!!! These are so creative. Love them! Frankie is fab and the owl is owldorable. Wow, Sue, your pizzas look so scary in the great good Halloween way of course :D Your ideas are the best! Your grandkids must think you are the world's best grandma! What fun you create in your kitchen. So cute and nice to have something savory in the Halloween reperetoire. You never cease to amaze me. Once again your post brought a smile to my face. This is so fun and the pesto alfredo sauce sounds amazing. Oh Sue these are both so fun, love them!!! The pizza's are so creative and look delicious! I love your candy corn cheese cake as well, oh, I just love all of your ideas! These are so cute and creative, I especially love the owl! Your stoneware look like mine!! I love these pizzas, they are too cute! Ahhhhhhhh!!!!!!!!!!!!!!!!! Sue this is well, I may have SQUEALED!!!!! Love! How fun are these?!?! Such a cute idea! I love them!! What a fabulous idea! Spooky and funny all at the same time. So great! BTW, if you ever want your header painted on a ceramic tile for you to use (As a working trivet) or just for a fun display, please contact me. You have the cutest design!!!! It would be adorable! Your Halloween pizzas are inspired! Enjoy the season! wonderful is so many ways...I love pizza and these are a great way to add some fun on a Friday night Pizza night! Wow these are awesome! I miss making pizzas fun. I remember my mum making spaghetti for the hair. I really need to try making homemade pizza, I'm always so impressed with any that I've tried! I used your idea and posted the pic on my blog! We made monster pizzas tonight for our little family Halloween party. SO PERFECT!!! My 4 year old was laughing while making them and couldn't wait to show his dad. THANK YOU for such a fun idea!! !